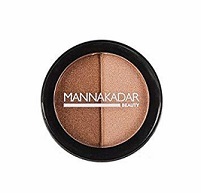 Manna Kadar Beauty Bronzer Highlighter. From Manna Kadar's website: "Long-Wear Powders comes in two textures, matte and pearlized. The custom formulation offers a special light texture which glides on smoothly and evenly to provide the perfect amount of color for a healthy glow. Powders can be used as a blush, bronzer, highlighter and shadow." Full Size. Comes in colors: Radiance.